An additional source of folic acid and vitamins B1, B6, B12. Folic acid – 0.15 mg, Vitamin B12 – 0.0007, Vitamin B6 – 0.44 mg, Vitamin B1- 0.33 mg, excipients. Folic acid prevents formation of fatty liver and improves gastrointestinal tract functioning. In addition, folic acid participates in neural impulses transmission, providing for normal functioning of both peripheral and the whole central nervous systems, including improving mental activity. Insufficient folic acid consumption with food results in a number of adverse effects. Folic acid deficiency results in dermatological diseases in human; shifts in blood count are observed. It leads to liver dysfunction, central nervous function suppression (depression, chronic fatigue, memory and attention impairment, diminution of intellectual output). Due to folic acid deficiency mental and physical development of children is retarded. Folic acid deficiency in the pregnant is connected with high risk of fetal neural tube defects. Vitamin B9 (folic acid) and vitamins B1, B6, and B12 are interconnected that is why it is recommended to take a complex of these vitamins. Vitamin B12 is necessary for normal hematopoiesis and RBC maturation; it has positive effect on the liver and nervous system functioning. Vitamin B1, just as folic acid, can affect neural impulses transmission. 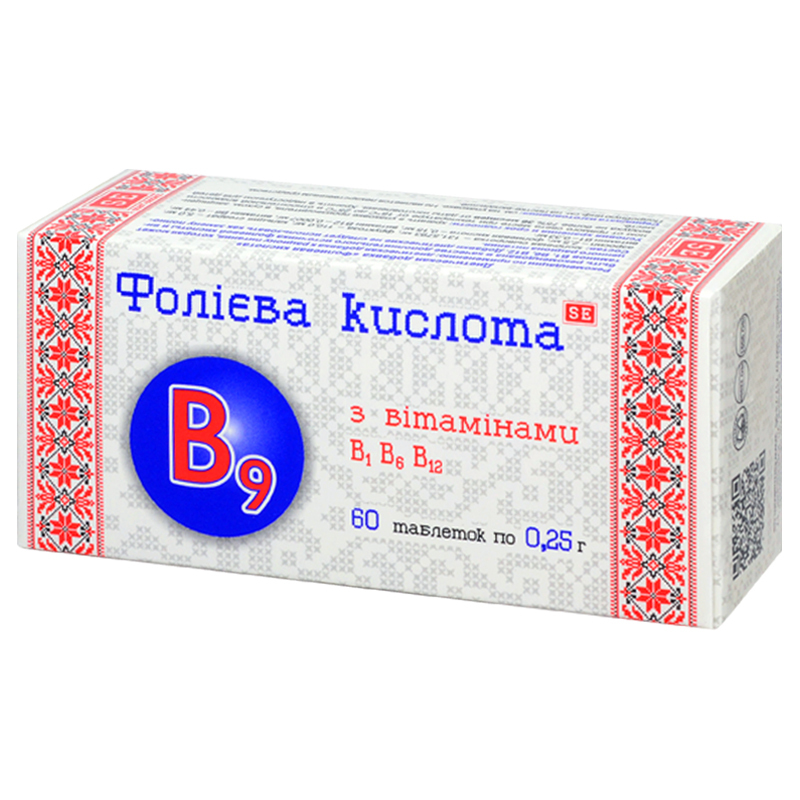 Vitamin B6 supports normal functioning of central and peripheral nervous systems, it participates in metabolism of some amino acids, as well as in lipid metabolism processes. Adults take 1 tablet twice a day with food. Term of use – up to 1 month; further, the term of use and the possibility of repeated use are to be agreed with a doctor. Individual sensitivity to certain components, children under 12. Proteins – 0.2 g, carbohydrates – 12.9 g, fats – 0.1 g.